Hi there! Today’s post is on the comet C/2015 ER61. Behind this weird name is a small object orbiting the Sun on a highly elongated orbit, which currently shows us a tail. The associated study is Beginning of activity in long-period comet C/2015 ER61 (PANSTARRS), by Karen J. Meech, Charles A. Schambeau, Kya Sorli, Jan T. Kleyna, Marco Micheli, James Bauer, Larry Denneau, Jacqueline V. Keane, Elizabeth Toller, Richard Wainscoat, Olivier Hainaut, Bhuwan Bhatt, Devendra Sahu, Bin Yang, Emily Kramer and Gene Magnier. It has recently been published in The Astronomical Journal. This comet was discovered two years ago, in March 2015, by the telescope Pan-STARRS 1, located on the Haleakalā, Hawai’i. Its distance to the Sun was then 8.44 Astronomical Units, its absolute magnitude about 12, and no tail was visible. As such, it was supposed to be a Manx object, a Manx being a tailless cat. A Manx object would be a comet, which had no activity anymore, as if the lighter elements had already gone. From its magnitude, it was guessed that its radius was about 10 km. Its apparent lack of activity triggered enough interest for the object to be followed, this in particularly permitted to determine its orbit, and showed that it had a huge eccentricity, i.e. some 0.998. When the eccentricity reaches 1, then the orbit is parabolic, so the orbit of C/2015 ER61 is almost parabolic. Further observations showed the beginning of a period of activity, proving that C/2015 ER61 (I would appreciate a funnier nickname…) is actually not a Manx. This period is not done yet, and the activity is actually increasing, as the comet is approaching the Sun. At its smallest distance, i.e. the perihelion, its distance to the Sun is 1.04 AU, i.e. it almost crosses the orbit of the Earth (don’t worry, I said “almost”). So, observing this comet today reveals a tail. We are actually pretty lucky to be able to observe it, since its orbital period is some 10,000 years. This comet is considered to belong to the Oort cloud, which is a reservoir of comets at the edge of our Solar System. Since the comet model by Fred L. Whipple, published between 1950 and 1955, a comet is seen as a kind of dirty snowball, with a nucleus, and icy elements, which tend to sublimate when approaching the Sun, because of the elevation of the temperature. This hypothesis was confirmed in 1986 when we were visited by the well-known comet 1P/Halley (you know, Halley’s comet). The idea is this: you have some water ice, some CO, some CO2, trapped on the comet. When it is warm enough, it sublimates. the thermal inertia of the comet: how does the temperature elevate? its albedo: which fraction of the incident Solar light flux is reflected? This means that observing and measuring this outgassing gives some physical properties of the comet. Wide-field Infrared Survey Explorer (WISE): this is an infrared space telescope, on a Sun-synchronous polar orbit. It is used in the program NEOWISE, NEO standing for Near-Earth Objects. The diversity of observation facilities explains the numbers of authors signing this study. 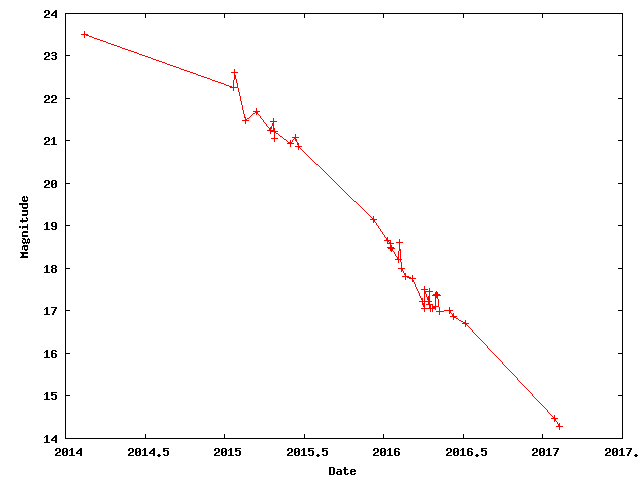 The observations span from February 2014 to February 2017, which means that there are pre-discovery observations. It is always easier to find an object when you know where it is, which permitted to find C/2015 ER61 on images, which were taken before its discovery. These observations (see the Figure) has shown a variation of the magnitude, which could be expected since the comet approached the Earth, but too large to be explained by its trajectory. Actually, it is enhanced by the activity of the comet, more precisely by the sublimation of CO and CO2, starting in early 2015. 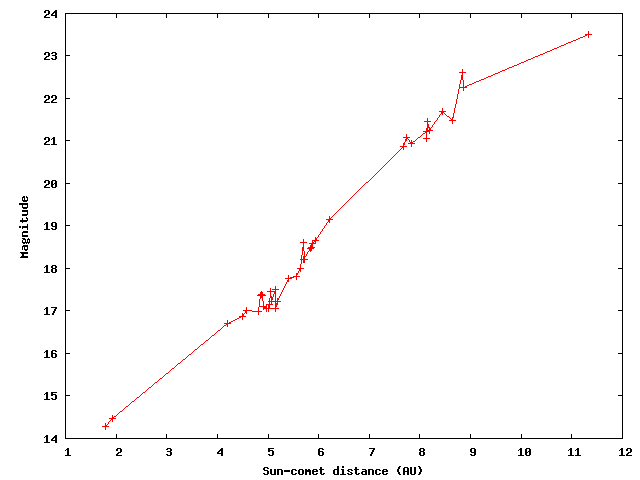 The measured apparent magnitude of the comet, with respect to the date and the distance to the Sun. We can see that the comet is brighter when closer to the Sun, because of the outgassing. The measurements have some uncertainties, which are not represented here. This figure is drawn for the Tab.1 Observation Log of the paper. The authors modeled the warming of the comet and the sublimation of the elements, in using the well-known heat equation. The observed tail suggests a radius of the nucleus of about 9 km, which is consistent with previous guesses. Moreover, they suggest that the CO2 is present at a depth of about 0.4 m. If it were present at the surface, then sublimation would have been observed even when the comet was 20 AU away from the Sun. The closest approach of the comet with the Earth was on April 4, and with the Sun on May 10, which would result in a peak of activity… probably with some delay, please give the comet a chance to warm! That’s all for today! Please do not forget to comment. You can also subscribe to the RSS feed, and follow me on Twitter. Should this model prove correct, it’s a step toward understanding the evolution of comets like 67P. In addition, the results from this study imply that thermal cracking might happen faster than previously estimated in shadowed regions of other atmosphereless bodies, both near Earth and in the asteroid belt.